NVIDIA Home > Support Home Page > Knowledgebase Home Page > How to configure Passive or dual-pipe stereo with Quadro cards in Windows 7. How to configure Passive or dual-pipe stereo with Quadro cards in Windows 7. 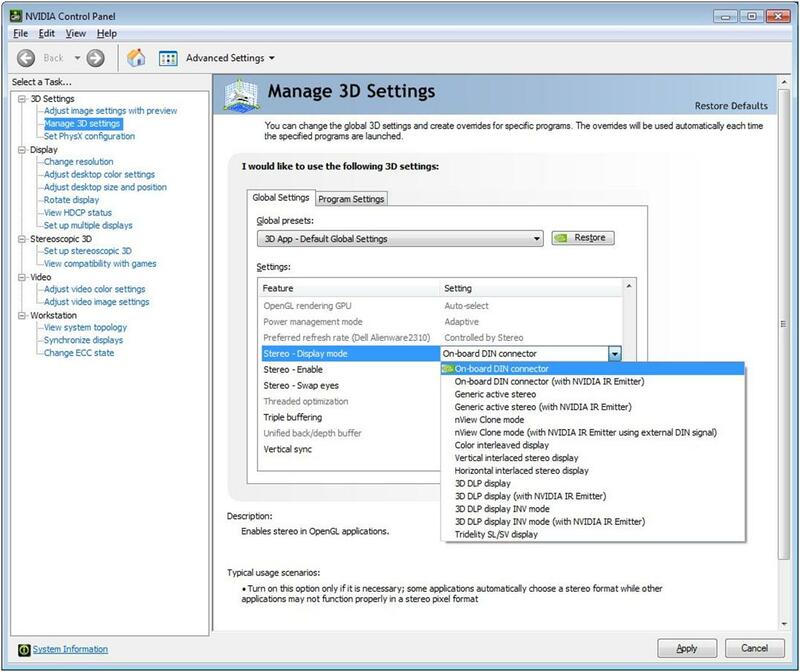 How to configure Passive or dual-pipe stereo on Quadro driver on Windows 7. Passive stereo is when left eye and right eye images are generated by the two separate ports on Quadro graphics card. It commonly used for two projector stereo, head mounted displays or dual-pipe stereo, where an active stereo projector requires separate left and right eye feeds. Which Quadro boards support passive stereo? 2. Select "nView Clone mode"from the drop down "Stereo - Display mode" menu - see Figure 1. 3. Set "Stereo - Enable" to "On" see figure 2. 4. 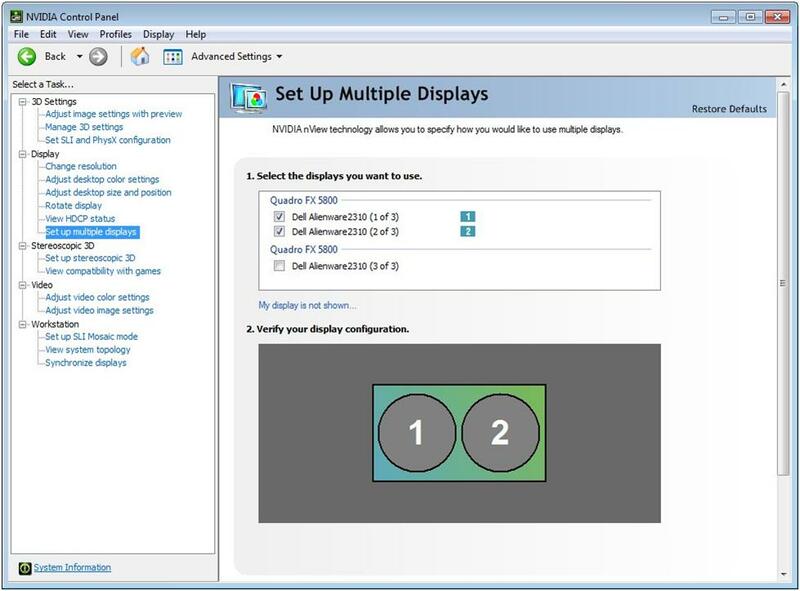 Go to "Set up Multiple displays" - select the two outputs on the graphics card (must be the same card). Right click on the display icon and select "Duplicate displays ……" see figure 3 &4. 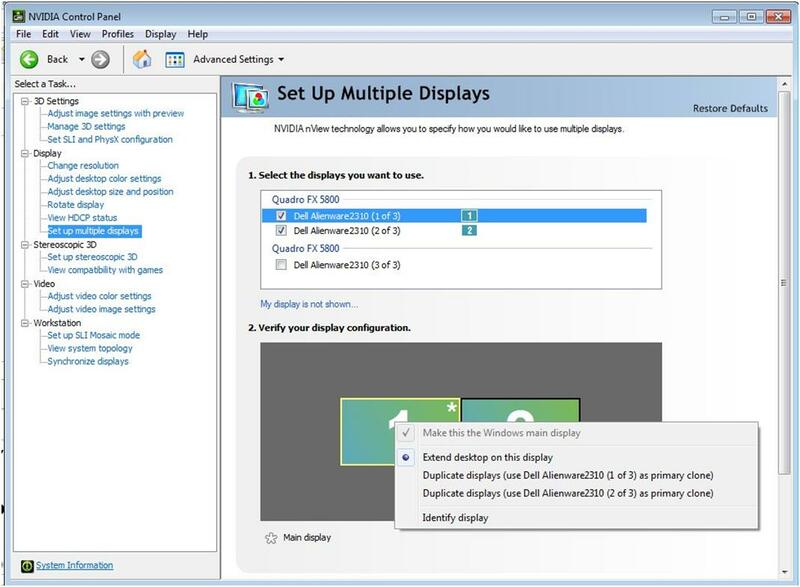 Figure 4 Set up multiple displays - with duplicate displays enabled. 5. Run an openGL application with stereo and left eye and right eye will display on separate display channels. 6. 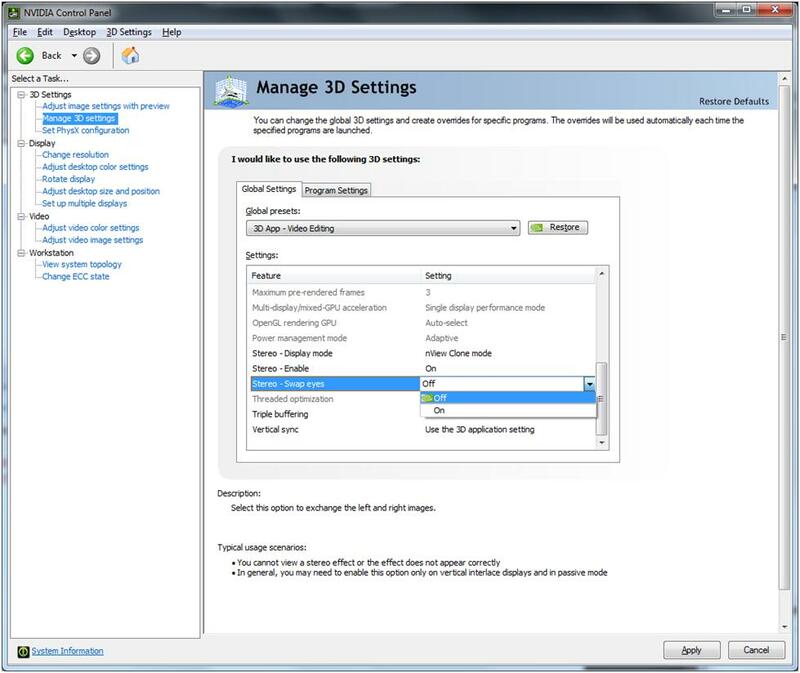 If the eyes are backwards, you swap them with the Stereo-Swap Eyes command in the Manage 3D Settings part of the nvidia control pane, see figure 5. 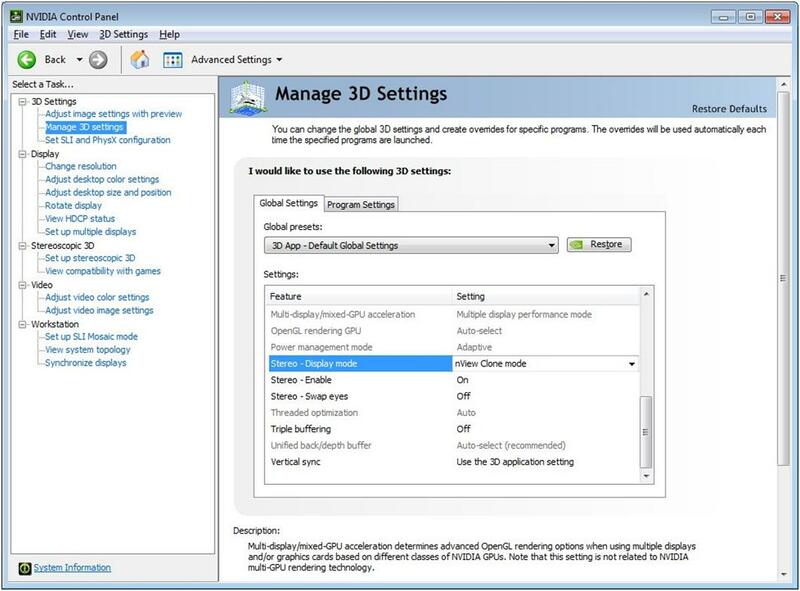 Note: For DirectX or 3D blu-ray stereo you need to perform these additional steps. 1. Stereoscopic 3D menu. 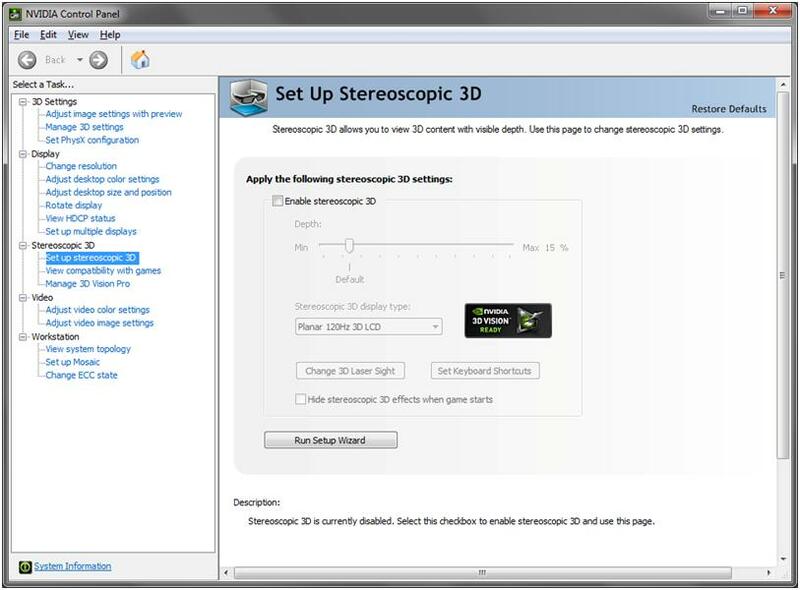 Check "Enable stereoscopic 3D" to enable DirectX stereo. 2. Run DirectX or Blu-ray 3D application. Stereo will now be from left and right eye. NOTE: for 3D Blu-Ray both display devices must be HDCP compliant. What is the difference between Quad Buffered professional 3D Stereo for Quadro and NVIDIA consumer 3D Stereo driver for GeForce? Can I use stereo and SLI frame rendering at the same time?